This is a direct apology to all tourists. To the globe-trotting adventurers whose style has consistently looked enthusiastically overprepared. It turns out: You were just early trend adopters. The so-wrong-they're-right (read: ugly) sneakers. The over-pocketed shorts that hit above-the-knee. Bright socks that refuse to fall down. Bum bags. Tracksuits. Before this year, I would have written these pieces off as entirely "uncool". But it's 2018, and it's a year of great, unexpected change. Now, many of the stereotypical tourist go-tos have found themselves circling around the high-fashion hub and landing on our S/S 18 trend report. What's happening? Practi-core? Tourist-core? I don't know, but I'm finding myself edging towards these once no-go items and looks on a day-to-day basis. 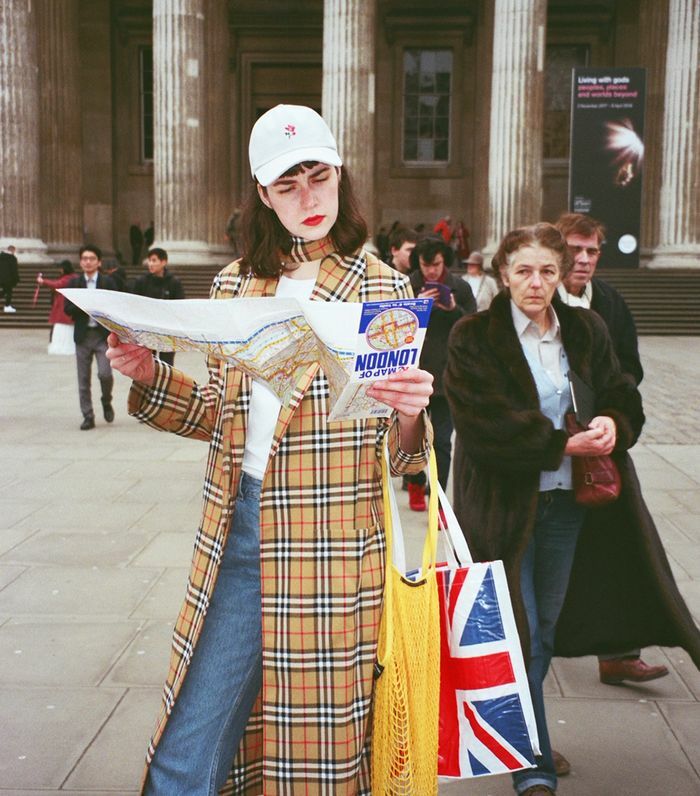 So I thought I'd test and update three "typical tourist" outfits—asking my model friend Sierra Spear to brunt the embarrassment outside the British Museum for me. As it turns out, there are ways to try these (actually quite sensible) trends without just looking like an American dad on his first trip to London. Here's how. On Sierra: Weekday Cap; Fila Sneakers (£80); Burberry Coat (£1990); L.L. Bean Jeans; Urban Outfitters Bag. This look nods to the tourist who just wants to blend in. They live for things "sooo English," can't wait to visit Buckingham Palace, and spend hours trying to find the real London Bridge. Keen as can be, they also look shockingly like an extra for the Gosha Rubinsky x Burberry campaign. On Sierra: Fila Sneakers (£80); Burberry Coat (£1990); L.L. Bean Jeans; Urban Outfitters Bag. Style Notes: Update this look by adding an It colour of the year throughout your outfit—we went for socks and accessories. On Sierra: Marc Jacobs Floral Shirt (£325); Martine Rose Shorts (£427); Weekday Bag (£20); Gucci Sunglasses (£335). Style Notes: Nothing screams "dad on tour" like a boxy floral shirt and cargo shorts—only in fashion echelons, the shirt is more likely to be Marc Jacobs than Matalan. This tourist knows "all the best places" despite never having been to the city. They have four kinds of plasters, extra batteries, a water bottle, a proper camera (no amateur business here, thanks) and a wad of currencies in their bum bag. Style notes: Adding oversized aviators and leaving the windbreaker at home takes this look from frumpy to cool. Think: more Adwoa Aboah, less European Vacation. On Sierra: Weekday Sweatshirt (£25) and Trousers (£70); River Island Shoes (£60); The Frankie Shop Earrings; Ashish Bag (£485). Style notes: Hello, tourist merch queen! Own your love of logos, channelling perhaps your fabulous aunt who's tagged along on the family vacay. Go OTT (lavish heels) and low-key (track pants) at the same time. On Sierra: Weekday Sweatshirt (£25) and Weekday Trousers (£70); River Island Shoes (£60); The Frankie Shop Earrings; Ashish Bag (£485). Style Notes: Think of the tracksuit as your (very comfortable) blank canvas. It allows you to wear all your most elaborate accessories at once.